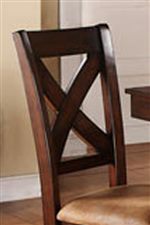 This X-back side chair brings easy, beautiful style all while offering a comfortable seat. The upholstered seat will keep you comfortable during any meal or gathering, and it's supported by four strong block legs. The X-back design is complemented by the X-design featured on the dining table's trestle base. The Java Transitional X-Back Side Chair with Upholstered Seat by Winners Only at Crowley Furniture & Mattress in the Kansas City Area: Liberty and Lee's Summit, MO & Overland Park, KS area. Product availability may vary. Contact us for the most current availability on this product. The Java dining and living room collection brings you the best in rustic styling, while still allowing for a fun and inviting environment. Beautiful veneer and hardwood is brought together to create clean designs with a rustic element. Complete with a beautiful Mango finish, the Java collection is a dynamic option that will complement a variety of home styles. 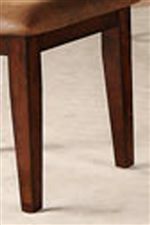 Welcome the transitional Java collection to create a warm and relaxed atmosphere in your dining room and living room. The Java collection is a great option if you are looking for Transitional furniture in the Kansas City Area: Liberty and Lee's Summit, MO & Overland Park, KS area. 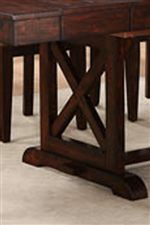 Browse other items in the Java collection from Crowley Furniture & Mattress in the Kansas City Area: Liberty and Lee's Summit, MO & Overland Park, KS area.